We are glad that you are interested in taking a kayaking trip with us and spent your holidays in Greece with Enjoy-Crete. Below you will find a list of common questions and other useful information that will help you choosing the right day or multi day / expedition kayaking trip with us. Do you have some dates in mind? Start with a look at the published dates for our multi day / expedition kayak trips. Sea Kayaking day trips are planned on a daily basis based on weather conditions and bookings. You can browse our whole list of kayaking day trips and use the relevant booking form that exist on each page to confirm your booking. Next to every trip there is a short section with questions and answers (FAQ), please be sure you read that before getting in touch with us along with this very helpful post which helps you choose the best day trip. Are you not sure what skill level you are? Day trips require no previous knowledge when weather is calm. When conditions are rough and your experience is not enough we will try to change the dates if possible. If not a full refund will be given. Most of the multi day trips require skill levels close to 3* (based on British Canoeing) while the most demanding sea kayak expeditions close to 4*. The difficulty of each expedition is outlined on its details page. If you are not sure about your skill level please contact us. Great! Just use the relevant booking form that exist on each day trip or expedition. Be sure to read before our FAQ for day trips or multi day trips that are listed next to each trip. There is also a more generic FAQ for day trips which can be found here and for expeditions here. Looking for a rental kayak? Please check out the rental page, it has all the information you will need. Bare in mind that we do screen people thoroughly. Please do not be offended; we take the responsibility very seriously, and we haven’t had a chance to get to know you yet! To inquire about rentals, please be sure you read everything we got under our rental page and especially the requirements. Looking for a specific trip but don’t see dates for it? It could mean we don’t have it planned in the near future, or we don’t have enough interest for other dates. Email us discuss further. Interested in a custom trip for yourself, your group, or your family? Please contact us! Planning at least 2 months in advance ensures the best availability, but try us anytime. Wondering about our cancellation policy? You can find that info here on the Terms and Service page. 1. Quality of equipment (kayaks from NDK, Valley, P&H, North Shore). 2. Training and certification of guides. 3. Small groups (max 6 on most trips). 4. We can guarantee trips with rough water for experienced paddlers. 5. Most of our guides are local with extensive knowledge of the island of Crete. 6. Most importantly, our speciality is you. We are a small company run by paddling enthusiasts for paddling enthusiasts. Your trip is a unique, special experience, not an assembly line. Your vacation time is precious and worth our very best! You can check out our reviews on Tripadvisor or on our Facebook page to get an idea. 7. 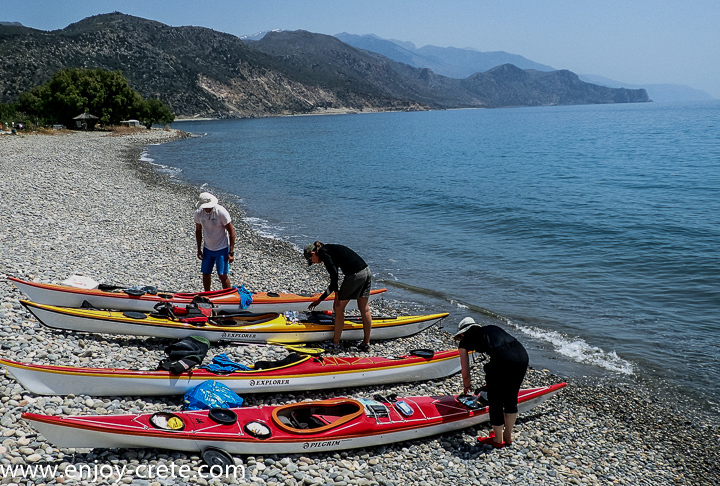 We offer trips all year round and we are able to guide a custom sea kayak expedition anywhere in Greece.